If you’re less than crafty, not exactly a seamstress or a recovering perfectionist (or, you know, ALL OF THE ABOVE), this is the holiday project for you. If you happen to have one or two or a dozen wire hangers hanging out in various closets and your laundry room (where do those things come from, anyway? ), EVEN BETTER. 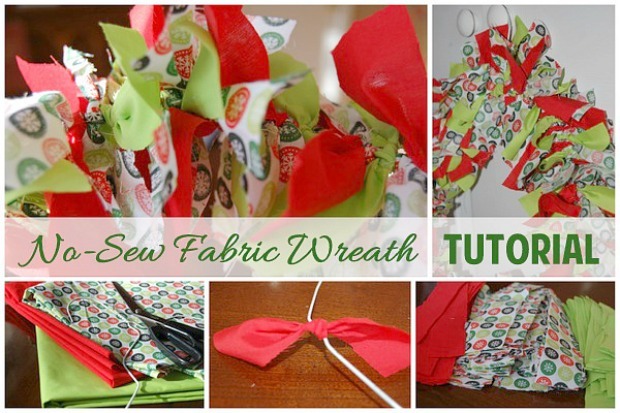 All you need to make a fabric wreath for any holiday is a couple yards of fabric, that pesky wire hanger and a pair of good scissors. Pick out two to four complementary prints or solids. 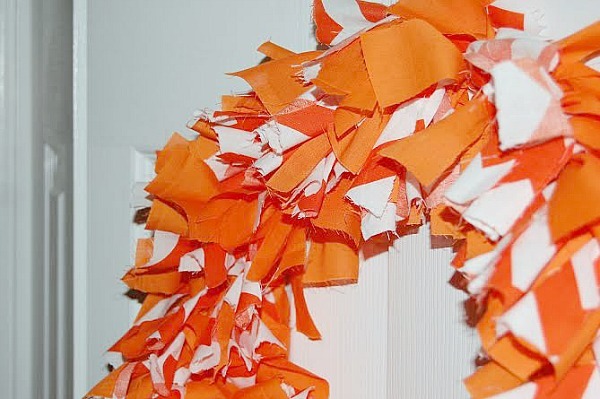 You really can make a wreath for any occasion – to decorate for Christmas or autumn or the Fourth of July, to match your front porch or kitchen walls, or even to cheer on your favorite team. And when a project takes just a couple hours and requires absolutely no sewing, well, why not make one for every occasion?! 2. Cut fabric into approximately 150 strips, 1 to 1.5″ wide by 5 to 6″ long. 4. Tie each strip around the hanger, keeping each “tail” about the same size. Add strips in a pattern of your choosing, alternating between patterns. 5. As you tie the strips, scrunch them as close together as possible. You should be able to fit all 150 strips around the hanger. 6. Hang on a door or on the wall – or give it away as a gift! 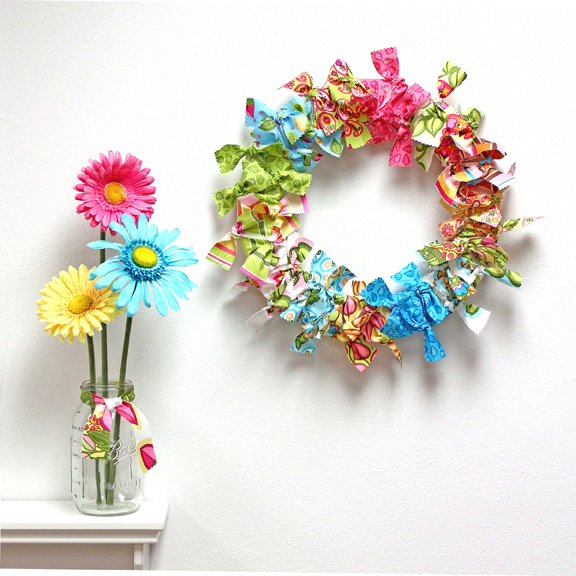 In addition to being a simple project that doesn’t require precision or extensive sewing skills, making this fabric wreath is a great craft to make with friends (it’s easy enough that you can make it while chatting, listening to music, or catching up on the shows backed up on your DVR!) or kids (they can hand you the strips or even make their own wreaths). And of course, since college football rules the world right now, everyone needs to give a nod to their favorite school colors. This is a perfect project to keep those fingers happy during the entire game. 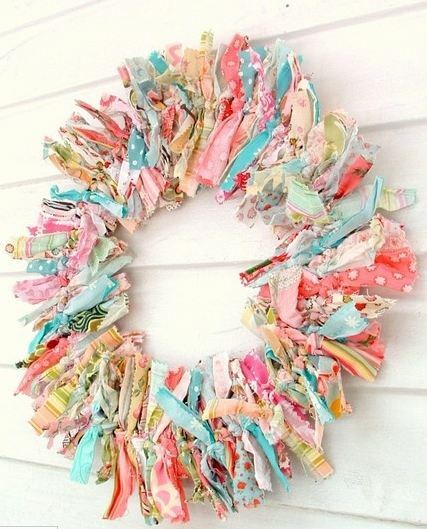 What colors or occasion would YOU choose for this easy, no-sew fabric wreath? Mary Carver is a writer, believer, wife, mom and recovering perfectionist. She writes about her imperfect life with humor and honesty, encouraging women to give up on perfect and get on with life at www.givinguponperfect.com. I love all the different options on this. See, this is exactly what I need, something very little talent is required! So you just twist it back together at the end, I suppose…but what happens to the “hook part” we were told not to untwist? It isn’t visible in any of the pictures. I am going to try this (having failed miserably at the ornament wreaths that were all the rage several years ago). You never untwist the hanger. You simply fill up the main part of the hanger (the body of the hanger? what’s the right term??) with your tied strips until it’s completely full. Then you use the hook part to hang the wreath. It will be undecorated but not really an eyesore because it’s not large and it IS the hook to hang it with. Does that make sense? @Mary @ Giving Up on Perfect, Thank you! If/when you decide to tackle the ornament wreath, my advice is to glue the ornaments on some kind of base. That hanger or fishing line gets heavy to deal with. And you have the additional problem of the tops of the ornaments popping off. Just my two cents’ worth. Indeed this is the easiest and fastest way to create a stunning Fabric Wreath, suitable for those who have not enough time to spend with in making some like me, I can’t wait to try it, luckily I have a perfect fabric for it. I have an art degree and can do all sorts of crafts, but no wreath I’ve made has ever been more than okay. Guess I’m just wreath impaired . . . but I think this will work for me! Thanks. I wrote an ebook almost 2 years ago, with this project, and these same instructions almost word for word. Sigh. This was a guest post written for me by a girl who is above reproach. This is a wonderful craft that has been around for decades, so I am sure that this is her own twist on a loved craft and not copied from anyone else’s work. If you can prove otherwise, I am glad to give credit where credit is due but the craft itself has been loved and made by grandmas from years ago. 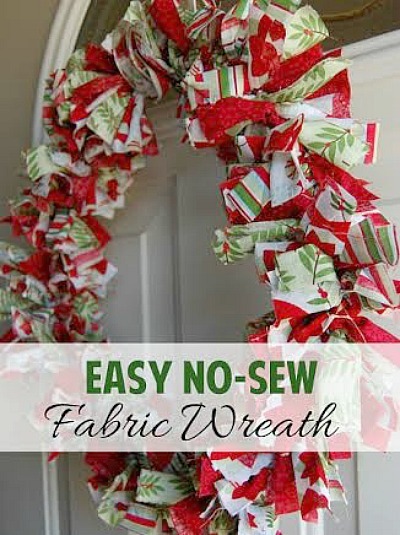 I love this and have made similar wreaths. I am thinking about using the two young grandsons little shirts that no one is wanting anymore to make a special wreath. Mary – that is such a fabulous idea! I’d love to see a picture and add it to this post when you are done. What a great way to preserve some special mementos. Would love to make one for a baby nursery. Would flannel from home made receiving blankets work? Is it stiff enough fabric ? A girl one sounds easy. Boy????? Plaid is the only thing I can think of at this time. Ideas, please. Just found out I am going to be a grandma and am going overboard all ready. Blankets, burp cloths, stuffed toys, pacifier clips….so excited. Congratulations Helyn – that is so exciting!! I haven’t tried flannel yet so I am not sure. I would think it may work, but you’d have to do extra ties to make it more full? Just guessing though. It would be so cute! Would 1 1/2 ” wide ribbon work on this wreath in place of fabric? it may, but I don’t think you would have the fullness. I guess it depends on the texture of the ribbon. You could try just a few and see. I’m planning a Christmas Wreath. Out of all the cloth wreaths I “Pinterest” ed, yours was the only one that told me how much fabric I would need so thank you! You mention buying two yards of fabric, but there are different fabrics and patterns mixed together. Do you need two yards of each different fabric or a grand total of two yards, meaning 1/2 yard of each different design, perhaps?